Wild geranium, Geranium maculatum, is a beautiful flowering herb that we see here on the mountain top. It flowers in the woodlands during May. The flowers grow in loose clusters at the stem tips. 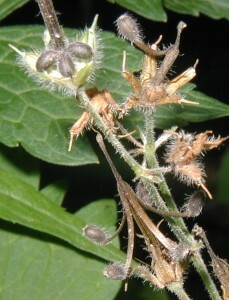 Stems are quite hairy and the seed pods themselves are very bristly. The long hairs on the seed pods and even on the seeds themselves aid animal dispersal of the seeds. The beak of this wild geranium seed pod suggests the common name, Cranesbill. When the seeds are totally ripe the beak splits up the middle and each seed is attached to a curved piece of the old beak. 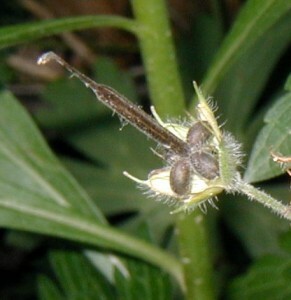 The seed capsule splits open with five seeds at the curled base. Note the bristles on the seed pods and seeds. Photos taken 6 June 2010. Click on any photo to see a larger view. Please give photo credit to “wildeherb.com”.